Observed sea levels are actually tracking at the upper range of the IPCC projections. When accelerating ice loss from Greenland and Antarctica are factored into sea level projections, the estimated sea level rise by 2100 is between 75cm to 2 metres. The two main contributors to sea level rise are thermal expansion of water and melting ice. Predicting the future contribution from melting ice is problematic. Most sea level rise from ice melt actually comes from chunks of ice breaking off into the ocean, then melting. This calving process is accelerated by warming but the dynamic processes are not strongly understood. For this reason, the IPCC didn't include the effects of dynamic processes, arguing they couldn't be modelled. In 2001, the IPCC Third Assessment Report (TAR) projected a sea level rise of 20 to 70 cm by 2100. In 2007, the IPCC Fourth Assessment Report (4AR) gave similar results, projecting sea level rise of 18 to 59 cm by 2100. How do the IPCC predictions compare to observations made since the two reports? Figure 1: Sea level change. Tide gauge data are indicated in red and satellite data in blue. The grey band shows the projections of the IPCC Third Assessment report (Allison et al 2009). Observed sea level rise is tracking at the upper range of model predictions. Why do climate models underestimate sea level rise? The main reason for the discrepancy is, no surprise, the effects of rapid flow ice changes. Ice loss from Greenland, Antarctica and glaciers are accelerating. Even East Antarctica, previously considered stable and too cold, is now losing mass. Considering the importance of rising sea level to a human population crowded around coastlines, how can we predict sea level with greater accuracy? An alternative way to predict future sea level rise is a semi-empirical method that uses the relationship between sea level and global temperature (Vermeer 2009). Instead of modelling glacier dynamics, the method uses model projections of global temperature which can be calculated with greater confidence. Sea level change is then derived as a function of temperature change. To confirm the relationship between sea level and temperature, observed sea level was compared to reconstructed sea level calculated from global temperature observations from 1880 to 2000. Figure 2 shows the strong correlation between observed sea level (red line) and reconstructed sea level (dark blue line with light blue uncertainty range). Figure 2: Observed rate of sea-level rise (red) compared with reconstructed sea level calculated from global temperature (dark blue with light blue uncertainty range). Grey line is reconstructed sea level from an earlier, simpler relationship between sea level and temperature (Vermeer 2009). The historical record shows the robustness of the relationship between sea level and global temperature. Thus, global temperature projections can be used to simulate sea levels into the future. A number of different emission scenarios were used, based on how carbon dioxide emissions might evolve over the next century. Overall, the range of projected sea level rise by 2100 is 75 to 190 cm. As you get closer to 2100, the contribution from ice melt grows relative to thermal expansion. This is the main difference to the IPCC predictions which assume the portion of ice melt would diminish while thermal expansion contributes most of the sea level rise over the 21st Century. Figure 3: Projection of sea-level rise from 1990 to 2100, based on IPCC temperature projections for three different emission scenarios. The sea-level range projected in the IPCC AR4 for these scenarios are shown for comparison in the bars on the bottom right. Also shown in red is observed sea-level (Vermeer 2009). Figure 3 shows projected sea level rise for three different emission scenarios. The semi-empirical method predicts sea level rise roughly 3 times greater than the IPCC predictions. Note the IPCC predictions are shown as vertical bars in the bottom right. For the lowest emission rate, sea levels are expected to rise around 1 metre by 2100. For the higher emission scenario, which is where we're currently tracking, sea level rise by 2100 is around 1.4 metres. There are limitations to this approach. The temperature record over the past 120 years doesn't include large, highly non-linear events such as the collapse of an ice sheet. Therefore, the semi-empirical method can't rule out sharp increases in sea level from such an event. Independent confirmation of the semi-empirical method is found in a kinematic study of glacier movements (Pfeffer 2008). The study examines calving glaciers in Greenland, determining each glacier's potential to discharge ice based on factors such as topography, cross-sectional area and whether the bedrock is based below sea level. A similar analysis is also made of West Antarctic glaciers (I can't find any mention of calculating ice loss from East Antarctica). The kinematic method estimates sea level rise between 80 cm to 2 metres by 2100. Recent observations find sea level tracking at the upper range of IPCC projections. The semi-empirical and kinematic methods provide independent confirmation that the IPCC underestimate sea level rise by around a factor of 3. There are growing indications that sea level rise by the end of this century will approach or exceed 1 metre. I have been looking for more information in this area as most sea level graphs only go back 15,000 years to the end of the last ice age. 125,000 years ago the earth had 300ppm of CO2 and a temperature 5c warmer than now and sea levels rose 6 to 9 meters. We now have CO2 at 390ppm and rising so what can we expect from sea levels? 6 to 9 meters would be very modest. There needs to be more information on this. A sea level rise of one meter wipes out Holland, London, Florida, and many other industrial areas so we need to know how soon. From all accounts London will cope w/1m, it's the upside of uncertainty in projections that inspires consternation. Other places are a different story w/1m. The common thread is that of getting in line for lots of money, early. Has there been a response to the issues raised by Dr. Nils-Axel Mörner? He does seem to be a very experienced expert on sea levels. Am interested in evaluating his comments on sea level inferred from earth's rotation rate and other approaches. He seems quite convinced that the claims of AGW vis a vis sea levels are spurious. Feedback welcome. #3: "evaluating his comments ... "
An interview that starts off with "there's no one who's beaten me" didn't do much for his credibility. When I got to "if the radius of the Earth increases, because sea level is rising, then immediately the Earth’s rate of rotation would slow down", I lost interest. Assuming the earth to be a uniform sphere (its not) one meter of additional radius would increase the earth's rotational inertia by a factor of 1.00000031, slowing the rotation rate in proportion. But the mass of water that moves outwards is much much less than the mass of rock that stays put, so the effect would be far less. His use of the familiar ice skater analogy is hardly appropriate in this context: rather than extending her arms changing her rotation rate, this is more like a drop of water on the tip of her nose. Mörner has written a number of works claiming to provide theoretical support for dowsing. He was elected "Deceiver of the year" by Föreningen Vetenskap och Folkbildning in 1995 for "organizing university courses about dowsing...". As I said, I lost interest. 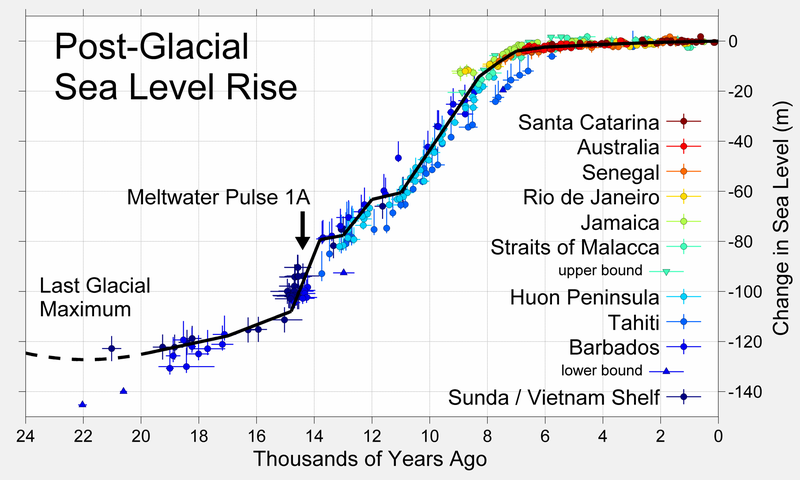 Sea level rise has historically been at 2mm/year. Has that changed? Harry Seaward, have a look at the graph immediately above, in Rob Painting's post, and you will see the current rate shown. However, looking at the graph today, the rate has gone up to 3.1mm/yr. The difference between the two graphs is actually due to the 'Inverse Barometer' being applied or not. Harry, if you check Rob's graph (comment 5) you will see that the rate since the 90's (when satellite measurements of sea level become available) is around 3mm/year. So the indications are that the rate of sea level rise has increased from the 20th century average of 1.6mm/year. Some of the world experts on sea level rise are Australian scientists at CSIRO, they have good webpage with some good information on SLR here. I'm looking at a TOPEX/Poseidon Jason-1/2 (CSIRO)chart showing 200 mm of rising ocean level over 130 years. This equates to a 1.54 mm per year rise. There is not much of an uptick in the curve corresponding to the increased levels of CO2. Let me check Rob's graph. Yes, it now shows 3.0 mm rate of rise. Almost double. Now I will go back to the latest CSIRO to see if they have similar data. Darm, you guys are making a believer out of me yet! At first, I was a GW skeptic, but then in the past year or so, I've really begun to study this data, and I'm convinced now that not only is GW real, but it's probably worse that what has been predicted. I'll just link to a few obvious sources for paraphrase and reference of data. Ok, anyway, what I noticed several months back is the simple fact that each year you have a net melting, whether sea ice or land-locked ice caps, it would be obvious that the change in albedo of that area of "net melted ice" should "pay" for it's own melting within a certain number of years. I assumed it would be an exponential, and was playing around with a bunch of different numbers for the exponential growth, but I didn't know exactly what numbers to use, until a few weeks ago. Suffice it to say that one of the articles I linked to above shows how the five year average rate of melting of ice in greenland is doubled in ten years. As it turns out, just recently, it was discovered that the rate has actually quadrupled in about 10 years! Well, what curve does that follow? And is it related to the PIOMAS data? Well, yes it is! Greenland and Sea Ice are treated as two seperate entities, but they follow the exact same curve: A power series. 200, 220, 240, 260, 280. But these were not measurements, these were his rough estimates based on 5 year total loss data, going all the way back to 1996 @ 96km^3 to 280km^3 in 2008. Well, what I would suggest is this is not a linear function. The numbers appear linear because he "reconstructed" the annual rates by just assuming it's increasing, but the increase isn't linear, it's exponential. x = time (delta) in years. You can see how if you were trying to "post-dict" this from field observations with normal noise in raw data, you might mistake this for a linear relationship due to errors in instrumentation, rounding, etc. Now, this is no big deal, its an exponential, which they calculated on the site, but the kicker here is that the 5 year average is itself "back heavy" by about 3 years. But what I noticed is you can smooth out the raw data from Greenland and the Sea Ice by simply noticing that they are the same thing, and adding the net losses together. The net annual loss from Greenland is currently "somewhere" around 300km^3. 940 +300 = 1200km^3 annual loss. If you then assume the entire ice mass is following about the same curve, you can start with 1200 as the coefficient, c, above, to run a series to see the rate of melting. Yes, I've done this, and God help us all, it's much faster than anyone publicly claims. Now, let's pick an exponential, say 1.15, a big one, and project the curve forwards. Well, you say that's too much? Hansen argued your case in Paleoclimate Implications for Human-Made Climate Change (2011). The bulk of the paper tries to compare current events to the last time this happened (although over much longer time frames) in the Cenozoic, Holocene and Pliocene, when sea levels rose 15m to 25m. You would be most interested in section 6, however, on sea levels, where he argues that the increase is probably not linear, but instead with a potential doubling every ten years, with all of the nasty implications that you yourself have tuned into. Now remember, I'm not an expert and don't claim to be. Now Sea level rise from 1995 to 2005 was around 30mm to 40mm, depending on who's data you believe, and 20CM in the last several decades of recorded history. Which is what is misleading about this. The oceans do not top heat very well. The majority of the depths of the oceans is in total darkness, and most of the heat concentrates near the surface, sort of like your swimming pool, the top few inches are hot, but the lower levels are cooler. So in reality, almost no thermal expansion actually happens unless you heat the entire water collumn by an average of 1C, but to do that, you'd really need to heat the surface temps by an average of about 2C or 3C, if not more than that, to make up for the fact hot water doesn't mix well in the deep oceans. At any rate, the amount of heat required to heat the hydrosphere by the average 1C to cause 7CM of thermal expansion (as vertical sea level rise) is 4200 * 1.4*E21 Joules. This is equal to 391 days worth of the entire solar constant, if all energy went to nothing other than raising the temperature of water, which is completely ridiculous and we obviously know isnt happening. Anyway, by the time you take this into consideration, and SST has only risen about 0.9C average in the past century, then thermal expansion is probably no more than like 3cm or 4cm, but whatever. If I calculate that out based on approximate surface of the ocean, I get a volume of 7.6485E12 meters cubed. This is 7648.6 kilometers cubed worth of ice melted in the past 10 years. Keep in mind, I'm just using "round" anecdotal numbers. I got a total, using round numbers, of 2100. Ok, well, admittedly, that's only around 1/4th of the total we need, however, we didn't consider Antarctica is probably melting at about the same rate, and we didn't consider other ice melting and snow packs melting earlier, and things of that nature. If you double it to make up for Antarctica probably melting similarly, that gives around 4200. [DB] Note: This comment was moved from the Climate and Sea Level: An Emerging Hockey Stick thread to this one. It is clear in the above post's graphs and elsewhere, sea level rise has been accelerating through the past 100 years - I presume that ClimateWatcher's first graph, covering just 23 tide records, is an unrepresentative sample. As I understand it the Greenland Ice Sheet is unlikely to collapse because it is surrounded by coastal mountains. The Antarctic sheets are however a different story. Greenland inner plateau is high as well. However, you dont need to melt all of it to get very wet. The GIS is drained very effectively by many marine-terminating ice-streams which penetrate into the heart of the sheet. Thus, decadal doublings of mass loss which can raise global sea levels by several meters per century have been observed in the paleo record. So even if the GIS takes several centuries to largely collapse, the ramifications of the collapse will still be felt this century. By us, our descendants and our civilization. CW#14:"Greenland encountered significantly more summer sunshine for thousands of years around six thousand years ago, but this did not effect sea level:"
We're seeing more melting now than we did 6kya, yet (according to your unsubstantiated statement) we're now seeing less sunshine. Wonder what must be different now compared to then. Could it be that there's something in our atmosphere now that is keeping things warmer? Something that wasn't present in as large a concentration during 6kya? Mods: Rob Painting's graphic @ 5 must have been moved. When I try to display it, I see "The requested URL /files/current/sl_global.jpg was not found on this server." On topic, am I right in thinking that the rate of melt of the ice sheets will increase as they lose mass: ie the more they melt, the faster they melt? Something about mass relative to surface area, if I recall my high-school physics from 45 years ago. Would be interested in the SkepSci crew's take on those questions. So, you have a prediction for sea level rise of between 750mm and 2,000mm, but have observed rates of 3.2 mm/yr. 100 yrs X 3.2 mm/yr = 320 mm. So, essentially, you are predicting a substantial increase in the rate of rise.Looking at the graph of sea level rise for years 1880-2000,there does not seem to be much chance of your prediction coming true. A gradual, steady increase from 3.2 to 11.8 mm/yr by 2100 would give you an increase of 750 mm after 100 years, but it would take a steady increase to 36.8 mm/yr by 2100 to give you a 2 M rise. I realize you are not advocating for a linear increase, but the math is simpler and the principle remains the same. Bottom line, I don't see any evidence that these increases are occurring, so I don't see the predictions happenning. Um, you did look at figure 2, that shows the rate of change increasing? Tamino's blog also has a recent post discussing some of this. And you realize how the rate of increase is going to depend on both warming of the oceans and increased loss of land ice, and future predictions of this don't depend on the past trend alone? First, you ignore the fact that the rate of increase has gone up over the last hundred years, then you do a linear extrapolation, then you admit that a linear extrapolation is not appropriate, but then you claim that the principle is the same and go ahead and do it anyway, because "the math is simpler"???? Bottom line: you don't see any evidence because you're working so hard not to see it. Kevin @22, unless serious efforts to reduce carbon emissions are in place soon, the temperature difference between the end of this century and now will be approximately that between the coldest period of the Last Glacial Maximum and the Holocene average. That temperature difference was enough to cause a 100 meter rise in sea level in 8,000 years, the equivalent of a 12.5 mm per year rise. Given that, a rise of 0.785 meters (increase of annual rate to average rate of deglaciation over the century), or 1 meter (increase to deglaciation rate over fifty years, and constant thereafter) are likely. Given that the Earth warmed gradually after the LGM so the actual differential in temperature during the last deglaciation was less than what we will experience, and given that periods of much faster melting occurred durring the last deglaciation, sea level rises of 2 meters are a distinct possibility. I would agree with the Post 14 statement that the rate of rise - using a consistent measurement method - is constant. What tidal guage data set/type, or satelite data, do give different estimates, but none appear to show a change in rate. Can't take one data set in C and then go to F and say you have a temp acceleration, as an example of the same..
"Interested in comment from scientists on the Media watch story "AN ALARMING STORY" on 10 March about sea level rise, describing reportage of a 6 metre sea-level rise as alramist because they omitted the 4014 prediction-come-trueth date." The Media Watch (ABC, Australia) show has several problems, but arguably that is not one of them. As can be seen from the main post above, expected sea level rises by the end of this century vary from 0.57 to 1.1 meters, depending on the scenario, with confidence intervals of 0.81 to 1.65 meters for the warmest scenario (table 1). Those values are from a single study, and are higher than the IPCC values, who give a likely range of 0.45 - 0.82 meters for the warmest scenario by 2081-2100. That is, its upper 66% confidence range almost coincides with the lower 95% confidence range of the study above. I have heard several times that scientist making emperical projections of sea level rise think the IPCC relied to heavilly on models, and gave too low a value, but only a few expect sea level rises above 2 meters as even an upper bound. Those few (best typified by Hansen), argue not that very high sea level rises are likely, but that they are possible, and sufficiently probable that they should be taken into account in establishing climate policy. For what it is worth, I disagree with those very few, but several SkS regulars agree with them. Given that background, it is at minimum careless sensationalism to not mention the timescale involved, particularly given that a more or less specific time was given the the paper being reported on. Having said that, the Media Watch article is rife with inaccuracies itself. To start with (and most germaine), the two thousand year interval in the study was chosen as a period in which equilibrium will have been reached. That means they are predicting the sea level rise will be reached by 4014 AD, but do not specify that it will not be reached before than. Potentially much before them. In fact, while I consider it unlikely that the full sea level rise will be reached by 2100, it is certainly possible that it could be reached by 2500, and probable that it will reached by 3000 AD. Indeed, technically the article does not preclude Hansen's worst fears being realized, and the full sea level rise being reached in as little as 150 to 200 years. So, if leaving out the date is careless sensationalism, not specifying that the paper is stating the latest possible date for the realization of sea level rise must be considered careless soft pedalling of a real threat. Even worse, is Media Watch's describing a 6.9 Meter rise in Sea Level as "a worst case scenario". In fact, the paper in question mentions the number 6.9 exactly once. In table 1 it shows as the median (not worst case) percentage of the current population displaced by sea level rise with a temperature of 3 C (again, not the worst case examined). So it is neither a worst case, nor even a value for sea level rise. The worst temperature case looked at in the original paper is a 5 C rise, and as can be seen, even with a 4 C rise, the worst case (95%) at even 4 C is well above 12 meters. Even the median case at 5 C is an 11.5 meter sea level rise, so that Media Watch has stated as a worst case a value 40% less than the median value of the highest temperature examined. What is worse is that while 5 C is at the upper end of the likely range (66% confidence interval) for BAU (RCP 8.5) as given by the IPCC, that is just for warming until 2100. By 2400 warming could procede well beyond that point so that 5 C may be the worst case examined, but it is not by any stretch of the imagination a worse case scenario. Consequently, while Media Watch's limited point is fair, in making it they have made far worse errors in the opposite direction - errors that in fact contradict the study they are reporting on rather than merely eliding ambiguous information. Has anyone encountered informaiton showing how much water is pushed to other parts of the ecosystem whenever there is a loss of rainforest, or deforestation in general, whether to desertification or increased agricultural/farming practices etc.. i.e. 130000 to 150000 km loss per year is a lot of moisture pushed into other parts of the planets storage capability! without having done the research I would imagine the quantity over the past 60 years is enough to skew the data? 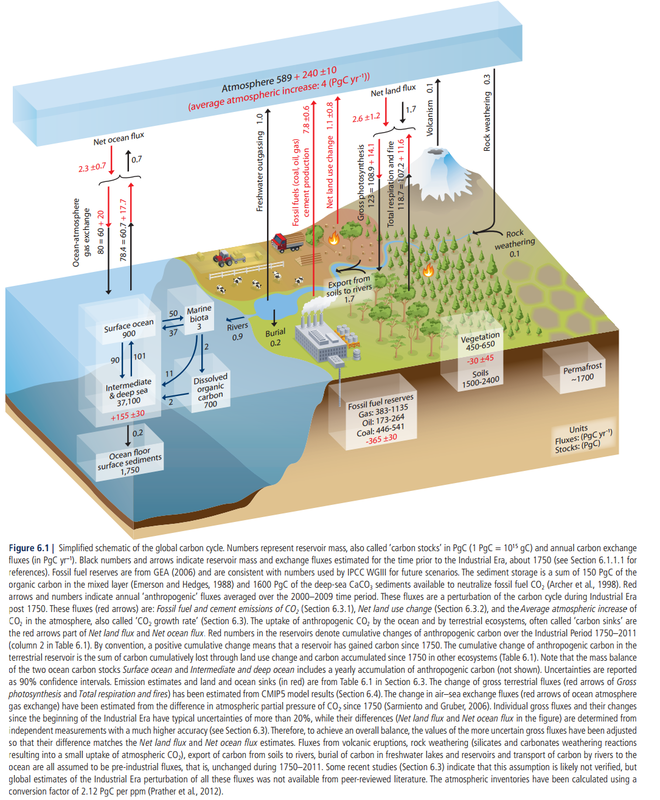 I only today read about the relationship of human pumping of groundwater to increased sea level rise. http://www.un-igrac.org/publications/422 snippet "because most of the groundwater released from the aquifers ultimately ends up in the world's oceans, it is possible to calculate the contribution of groundwater depletion to sea level rise. This turned out to be 0.8 mm per year, which is a surprisingly large amount when compared to the current sea level rise of 3.3 mm per years as estimated by the IPCC. It thus turns out that almost half of the current sea level rise can be explained by expansion of warming sea water, just over one quarter by the melting of glaciers and ice caps and slightly less than one quarter by groundwater depletion. Previous studies have identified groundwater depletion as a possible contribution to sea level rise. However, due to the high uncertainty about the size of its contribution, groundwater depletion is not included in the latest IPCC report. This study confirms with higher certainty that groundwater depletion is indeed a significant factor"
This got me wondering about the ground biomass canopy and animal life storage capacity of the vast forest losses each year. (Rob P) - See the SKS rebuttal: Sea level fell in 2010. There is a large year-to-year , and decadal-scale, exchange of water mass between the continents and ocean mainly due to rainfall patterns forced by La Nina & El Nino. The strong La Nina dominance over the last decade or so has stored greater-than-normal water mass on land. See Jensen (2013) - Land water contribution to sea level from GRACE and Jason-1 measurements & Baur (2013) - Continental mass change from GRACE over 2002–2011 and its impact on sea level - free copies are available online. This is part of the reason for the smaller-than-anticipated sea level rise in recent times - since the early 2000's anomalous water mass, equivalent to 0.2mm of sea level rise per year, has been stored on land. This is consistent with the increase in land vegetation (Net Primary Productivity) during that time. See: Bastos (2013) - The global NPP dependence on ENSO: La Niña and the extraordinary year of 2011. No surprise that water availability impacts plant growth. But a return to El Nino-dominant conditions (the positive phase of the Interdecadal Pacific Oscillation) hints at major problems in the near-future. Sea level should rise more sharply too as the water mass drains from the continents. What the IGRAC page is missing is another change to the land water balance which is empoundment - the building of surface water storages. Some time back I read a study - I don't recall now where it was - that estimated the increase of surface water storage in dams etc. Serendipitously this roughly balances out the loss of groundwater. You are correct, I mistakenly thought the resevoir and surface water effect was taken into account in this study. The following article from the National Geographic News updates the information somewhat, whilst raising further points for consideration :) http://tinyurl.com/NatGeo-Groundwater It also mentions the forest effect, though having not found figures for this I am going to estimate an average of 1cubic metre height of water lost per square metre of forest/rainforest loss, to take into account water held in ground, biomass, roots, animals, above surface trees plants and atmospheric humidity, this would equal one cubic kilometre of water every 1000 kilometres of forest lost, times this by 130 000 square kilimetres lost per year = 130 cubic kilometres of extra water per year that ends up largely in the sea. I would apreciate informed comments as to how far off my estimations are and as to if there is any significance to this quantily of yeatly increase affecting sea level rise... Mind you that last part I should be able to find out myself.. it's the per square kilometre water storage capacity of forest and attendents that are hard for me to assess. In case my last direct tinyurl link breaks, you can use this one but National Geographic will want you to sign in with email or facebook to read the article. http://news.nationalgeographic.com/news/2012/05/120531-groundwater-depletion-may-accelerate-sea-level-rise/? "Newly constructed reservoirs above ground can offset the net loss of water underground. These, Wada said, trap water that would otherwise reach the sea. Before 1990 or so, he added, that offset was large enough that the United Nations' Intergovernmental Panel on Climate Change never took groundwater depletion into account in predicting 21st-century sea-level rise. But that offset is no longer as significant as it once was, Wada said. "There are not so many places where people can build new reservoirs," he said. "They are already built." Already, he and his colleagues have found, groundwater depletion is adding about 0.6 millimeters per year (about one-fortieth of an inch) to the Earth's sea level. By 2050, he said, the triple pressures of growing population, economic development, and higher irrigation needs due to a warming climate will increase that to 0.82millimeters per year—enough to raise sea levels by 40 millimeters (1.6 inches) above 1990 levels. Between 2050 and 2100, according to some estimates, sea levels would rise even faster. To put that in perspective, he said, groundwater depletion adds about 25 percent to projected rates of sea-level rise, making it the largest contributor from land to sea-level rise other than the melting of the Greenland and Antarctic ice sheets. Even the melting of glaciers in the world's high mountains won't contribute more to rising sea levels, Wada said." BTW I can't see a facility to edit our posts, my last one double entried when my web browser had to "recover the webpage"... sorry! [JH] Your duplicate post has been deleted. Based on my estimation above (see 29.) 130 cubic kilometres of water directly lost each year to deforestation, spread over the world ocean surface of aproximatly 361 million square kilometres would equate to aproximately a 0.3mm rise per year, this allows for a percentage that would end up in rivers, reservoirs the atmosphere and the ground. I'm not a scientist or a skilled resercher so my quantities and sums must be checked, this is a significant figure so surely it is being accounted for somewhere and I'm just not finding it? (Rob P) - No, the scenario you conjured up isn't accounted for. Not sure why this would surprise you given that you seem unwilling to read the scientific literature on sea level rise and provide zero supporting evidence for your scenario. Gary Marsh @32, observations of the carbon budget show that plants represent a net sink of CO2, ie, that on average there is more plant matter on Earth at the end of each year than at the start. That means that plants are an increasing reservoir of water rather than, as you would have it, a decreasing reservoir. Absent other effects, the increase in net plant mass would tend to decrease sea level rise. Tom Curtis 33. do you have a data source for year after year plant matter increase? 1. was the certainty that 6 metres would take 2000 for sure which was why I asked it here. Polar ice melt in Arctic has outstripped previous IPCC AR high sensativity senarios since positive feedbacks like melt water fluid dynamics wasn't included. Surge factors of storms at kingtide can have a SL rise multiplier effect up to even 100x, although presumably that's more about inland effected areas than actual rise on the land/sea edge. 2. unknown timelines for under-researched 'methane burbping' of frozen gases in Arctic sea bed, tundra and Antarctic sea ice. Sensitivity of these gases to sea warming is somewhat in dispute and atmospheric GHG levels, and ocean warming pathways are still very much dependant on future human carbon intensive activity levels. The amounts of methane and COx stored frozen in these places dwarf the so-called remaining carbon budget of 565Gt (Meinshausen 2ºC concept). It's not clear to me the likely size or time of the earliest of these 'burps' but there is already wide columns of these gases rising into the atmosphere. It's not clear to me how much they would accelorate sea level rise. 3. the most critical problem with the MW report was the (blyth) omission of the fact that while the Opera House may not see sandbagging/re-footing for well beyond a millenia the climatic tipping point that will guarenty that consequence is likely to be yesterday, today or some time in the next few decades (Kevin Anderson, Tyndal Climate Centre). So urgency is justified (in preference to scoffing). That certainly sents alarm bells ringing for me even if MW think they; have better things to think about in 2 thousand years. The consequence of that level of sea rise on cities and agriculture (in combination with a warmer more extreme climate) will be way more significant than the damages bill to the Opera House of course. Please comment on issue of climatic tipping points regards polar ice melt and attendant methane/COx leaking, Tom. You will see that "Net Land Flux", ie, the balance between "Gross photosynthesis" and "Total respiration and fire" sequesters 2.6 +/-1.2 Petagrams C per annum. From that we must subtract the 1.1 +/- 0.8 Petagrams emissions from "Net land use change" (which includes deforestation). That yields a net sequestration of 1.5 +/- 1.44 Petagrams C per annum. The uncertainty is at the 90% confidence level, indicating that there is a better than 95% chance that the net flux sequesters a small amount of CO2 annually, and a remote chance that the flux is effectively neutral. It should be noted that there has been a net reduction of the carbon reservoir in plants and soil of 30 +/- 45 Petagrams of Carbon, equivalent to approximately 15 ppmv. It is therefore, likely that the net flux has not always sequestered CO2 over the last 264 years, but currently with tropical deforestation partially balanced by reforestation in the NH, and with the additional effects of CO2 fertilization, the reverse is the case. Tom Curtis - It appears that the information you've provided from the IPCC is refferring to Carbon and CO2. The scenario I proposed for consideration concerns the direct transfer of H2O/water, it being a quicker and more direct contributer to sea level rise when it is released via deforestation, tropical and otherwise. I appreciate there are an enourmouse amount of variables to be considered when attempting to quantify the water holding capacity of the myriad types of forest, especially when factoring in attendent animal life from microble to mammal, the subterranian trunk and canopy and micro atmospherical climate which will hold significant quantities of water when forested and much less when deforested! add all these factors together and there will be a net movement of WATER. Although related this is a different process from the movement of Carbon, certainly it would appear to have a much more immediate effect. So again I ask if anyone can show me the data or studies if they even exist. (Rob P) - You were provided with peer-reviewed literature in your comment @ 27, however you have not bothered to read any of it, or make any attempt to understand it. There has been a net growth in total biomass of land-plants over the recent decade, hence the uptake of carbon and water by plants has likewise grown. Gary Marsh @37, your initial premise is that there has been a reduction in plant mass. That is shown to be false by the IPCC data. If you now want to alter your premise by detailing water content of different sorts of plant mass, you need to actually provide detailed information on the relative water contents of different forms of plants, plus the relative growth or loss of those different plants. You may then get an argument up that supports some measurable impact on sea level rise, (though I doubt it). But if you don't do that legwork, you have nothing to discuss. Your theory becomes "If all these complex and unmeasured factors come out just right, then changes in the biosphere are increasing sea level through loss of water." To which is is sufficient to respond, "If they come out wrong, then you have the opposite, or no, effect". The later is far more probably sight unseen than the former. [JH] Please explain exactly how you did your "curve fitting" and provide the sources for the data that you have included in your post. Until you comply with this request, your future posts will be deleted. Jetfuel...your approach would almost certainly seriously underestimate the sealevels for 2012 and 2013 presented in the updated graph in the OP, since starting in 2006 looks like it would give you a steeper slope than the 3.2 mm /year overall average. Which is why we don't draw regressions on small subsets of the data, especially cherrypicked ones. Why would you take the trouble to go through the comments and ignore the updated graph anyway? With regard to lake levels, there has been little net change in level of the Great Lakes over the time frame of the sealevel observations. That includes this year. You must be thinking about seasonal changes, but those are irrelevant to sea level change since they are ephemeral. Also this year does not seem unusual when you look at the data. BTW moderators, the link to the updated version of the fisgure in comment 5 appears to be broken. Thanks TC for the updated graph. Yes I was referring to the trend line you would get from the graph in the OP. It's not surprising that with more data you get reversion to the mean trend line. The recent large fluctuations around that mean trend are pretty interesting though. I remember the decline was attributed to La Nina transporting water to temporary storage on land, but I haven't read anything really recent on that. Even the large La Nina in 98-99 didn't have as big an effect. I should look it up. Stephen, a significant part of the dip in 2011/12 ended up in Australia. Lake Eyre and several other lakes in Central Australia filled for the first time in years - flamingo heaven. Then slowly evaporated away over the next 2 years. jetfuel wrote: "Looking at Post #5's Graph above, the 2006 peak is about 2mm below the 2011 valley. I would draw a new best fit curve starting in 2006 that shows an 8 mm rise in 6 years, or 1.33 mm/yr." The human eye is only too good at finding patterns in noisy data, even when they don't actually exist. That is why statisticians have invented methods for this problem, variously known as "breakpoint analysis", "broken stick regression", "segmented regression" etc. What these methods do is determine whether the improvement in the fit of the model justifies the additional model complexity introduced by adding a breakpoint, which introduces at least two additional parameters to the model. If you don't follow standard statistical practice in this way and just pick the breakpoints by eye, you will generally end up overfitting the data and drawing meaningless conclusions based on the noise. It is the sort of thing that is a recipe for confirmation bias. So while you might do that, a scientist probably would know better. @ comment 5, is there any particular explanation for the drop in sea level circa 2011 in both the original graphic and the updated graphic? I looked up sunspots and there is some correlation but could that even make sense why it should? Are there any other explanations that work better? Rhoowl, assuming that this is in response to my comment here, given those specific values you are presumably referring to 'table 2' in the basic version of the article above. Of course, that table shows those two values as sea level rise by 2500 for two completely different emissions scenarios at opposite extremes of the uncertainty ranges... do you not have any idea what you are talking about here? Because that's the most charitable explanation I can think of for such a blatantly ridiculous argument. Rhoowl - Do you understand the difference between different emissions scenarios and the uncertainties (including modeled natural variation) for a single scenario? Your comment seems to indicate that you do not. I have a slightly off-topic, but to me pressing question about the IPCC graph displayed in #36: The net land flux is shown to be increased by 2.6 +/- 1.2 PgC(arrow downwards), however the Vegetation reservoir became de(! )creased ( -30 +/- 45 PgC). I can't see were the additional 'land' Carbon is ending up. This seems inconsistent. Is there a missing number in the graph?